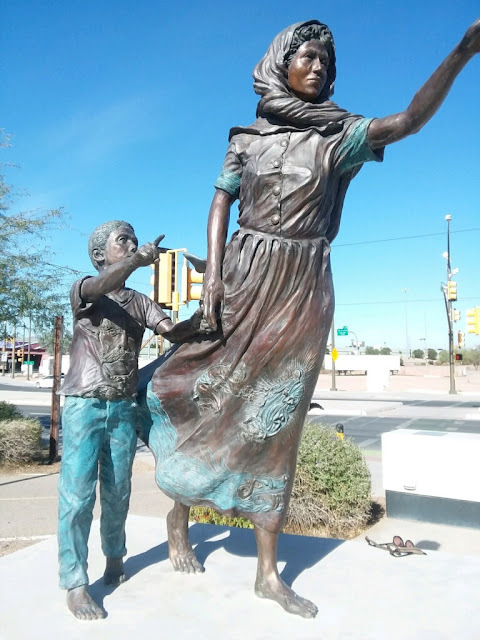 In one of my jaunts I ran across Luis Mena’s sculpture of the woman pointing at the Convention Center, a tear coming down her face depicting obvious sadness that her Barrio Viejo was demolished under the guise of urban renewal. It’s an exquisite piece, beautifully proportioned, showing movement and strong emotion. I knew then that I should interview this marvelous artist and I began checking the internet for a way to get in touch with him. I saw photos of him, a man of light complexion with sandy brown hair, maybe he’s a gringo I thought. I managed to find an email address and that led to our first telephone conversation that quickly forced a smile in me when I heard his slow drawl, full of Spanish accent and a vocabulary that said barrio vato y que! 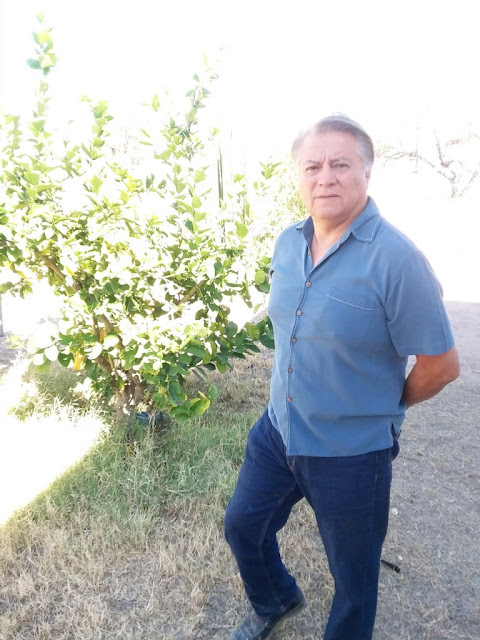 His house is on the corner of a large lot, surely at least an acre, in Barrio Anita, one of Tucson’s oldest barrios. In back of the main house three other small adobe buildings are situated that he tells me were, at one time, housing for the Mexican men that worked on the railroad and pointing out the misconception that Chinese workers laid the tracks which are but a stone’s throw from his property, He’s restoring them and one of them is his studio that he offers to show me. Upon entering the studio one is greeted by an old wood floor that feels is if it is laying on dirt but the attention quickly shifts to a large and colorful oil painting in the back portion to the room. Luis speaks slowly, extending the pronunciation of certain words in a very distinctive style. Luis- That’s the Virgen de los Remedios. 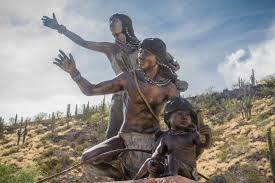 The original small statue was hidden inside a maguey at the time Cortez was fleeing Tenochtitlan, he and his men hauling bags of gold and stashing the Virgen, where it lay undiscovered until twenty years later. It’s a beautiful piece and attests to the fact that he is also a painter and has several murals scattered around Tucson. Luis- A good example is that television broadcaster that was told by the president to leave his conference and go back to Mexico. And he allowed himself to be escorted out without saying something like why don’t you go back to Germany or Scotland or wherever you come from! The Tohono O'Odham sculpture commemorating the site of the original Chuk Son Village (Tucson). Antonio- Where did you study? Luis- I attended the Fashion Institute of Design in Los Angeles. And I took some classes here at the university. But I already was an artist. When I was fourteen I exhibited at an exhibition with the sculptor Luis Jimenez. Antonio- You learned on your own? Luis- I had an uncle that taught me. He was a better artist than I was. Antonio- What can you tell me about the piece you did for the Tohono O’Odom. Luis- The TO’s are a beautiful people, very gentle and peaceful and I enjoyed working with them but I had a couple of challenges. When they first saw me all huero they weren’t so sure that I was the right person. But I told them that I was also an indigenous person but from Mexico. And then they wanted me to base my sculpture on a drawing by one of their members that had passed away. I told them that I couldn’t just infringe on another artist’s work but that I would try and honor his concept. When it was completed they loved it and they loved me too! We leave his studio and walk to another of the small building that he's restoring. At the concrete stoop, he's embedded a round bas relief of Cortez that one must step on before entering the room, a reminder of how Luis feels about the Spanish invasion of Mexico. Antonio- What's next for you Luis? 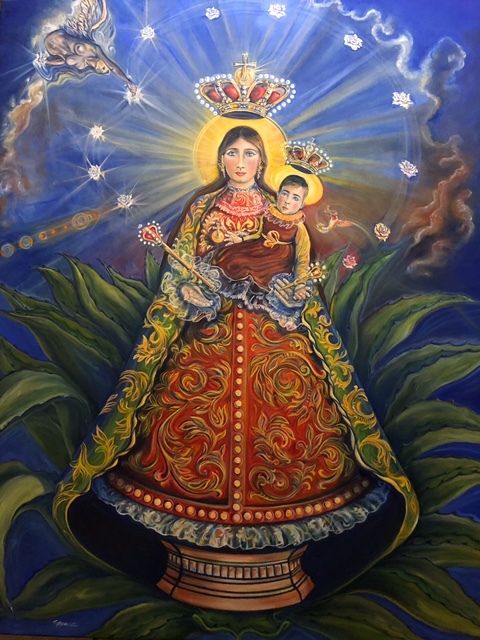 Luis- I'll be finishing the painting of the Virgen which is on commission and I hope to land a commission for another sculpture, that I can't talk about until it's finalized. It's not easy being an artist. High quality paints are expensive and I have to battle the prejudice and racism. Antonio. I hope you keep at it despite the challenges. I think your art is fabulous. Great story, Antonio. I mostly know his murals; the sculpture is new to me (though I've heard him talk about it). To see some of his murals, go to the Tucson Murals Project blog, tucsonmurals.blogspot.com and, in the search box in the right margin, search for: Mena. Is Anyone Goin' to San Antone?